"MacKenzie King did it, so did Susanna Moody. In fact, many Canadians consulted the spirits as part of a religious experience, to seek guidance for themselves and others, and to attempt to learn what lies beyond the grave. Some came to the seance room to hear ancient wisdom while others came to understand the nature of psychic phenomena. Like the mechanisms that produced the flashing lights, cool breezes, and whirling trumpets that materialized in the presence of the medium, their beliefs and experiences have been mostly hidden, until now." There may in fact be others, but this is the first scholarly study I have found that delves into the history of Spiritualism and early spirit communication experiments within Canada. I was therefore quite excited to come across this title not knowing if any others that cover this subject so extensively even exist. 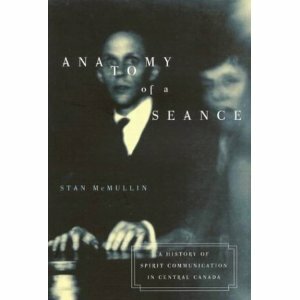 For a book aimed at an academically minded reader Anatomy of a Seance is not overly dry at all. I enjoyed the author's writing style, and found the reading to be fast paced yet still quite thorough. The author has utilised various material as mentioned within the book's description such as seance notes, personal correspondence, letters, diaries, images, and special collections to give us a good understanding of the roots of Canadian Spiritualism and the beginnings of serious psychical research and spirit communication within this country. The author shows how these early attempts were made, and the purpose of using a scientific approach and faith combined in order to better understand and perhaps even offer tangible proof of an afterlife. Spiritualism as a movement was hoping to offer a "scientific religion" and outlet for those wanting to conduct this type of research that was outside of the mainstream churches, and at the time saw much popularity and interest. I found this to be a fascinating look at these early psychical researchers, and that their purpose if not their exact methods to be inspirational. The book concludes with a brief look at modern spiritualism and spirit communication and how Hollywood and pop culture are now giving us our ideas of what a medium and seance is.